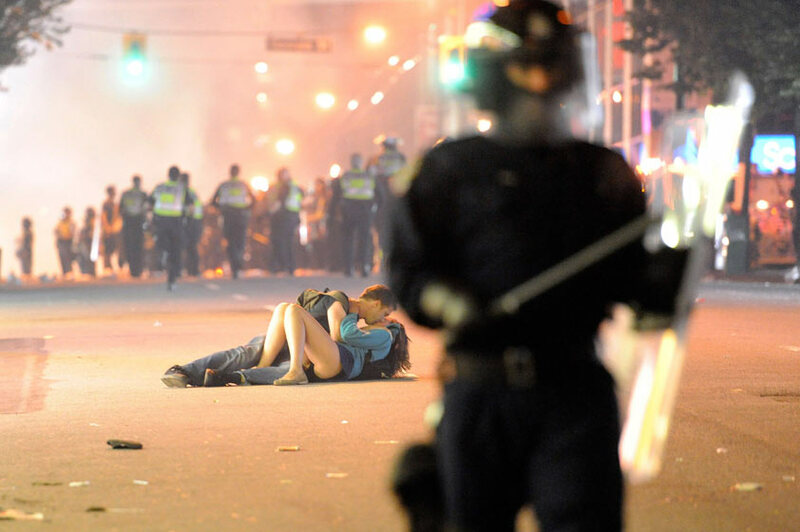 "Make Love Not War". This might be terrible news for the hopeless romantics entranced by the media-dubbed "Vancouver Riot Kiss". Following the Vancouver Canucks' 4-0 loss to the Boston Bruins in the Stanley Cup decider, disgruntled Vancouverites took to the streets, brewing up a riot that reportedly caused almost 150 people requiring hospital treatment and almost 100 arrested. However, an image taken during the chaos became an overnight viral sensation. What seemed to be an impossibly romantic moment of which the couple appeared to be oblivious to the violence happening around them and enjoying a passionate moment has been debunked: Scott Jones, the boyfriend, was actually shielding and comforting his girlfriend Alex Thomas, who was earlier knocked over by the riot police. And there might just be a reassuring kiss mixed up somewhere in there. The couple themselves, Aussie bartender Scott Jones and Canadian college student Alex Thomas, were interviewed. 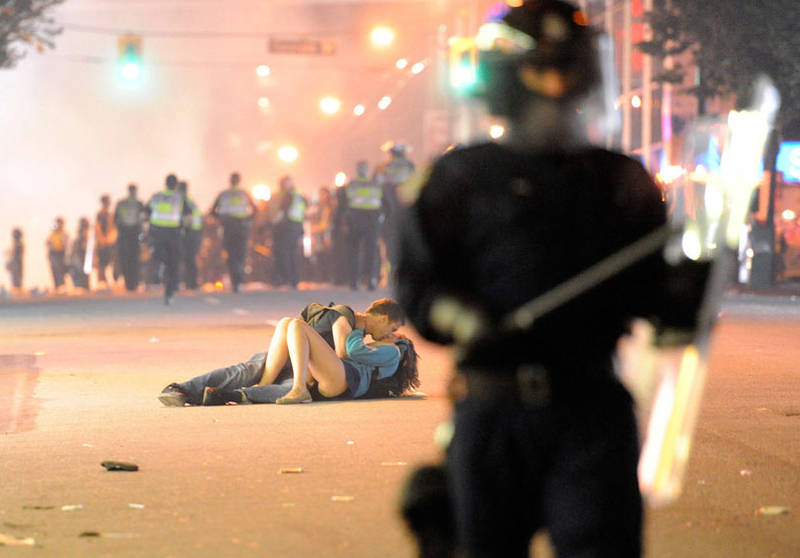 The photographer who took the now world-famous photo, Richard Lam, has indicated in an interview that he was originally of the opinion that one of the couple was hurt but his editor thought otherwise. "I knew I had captured a 'moment' when I snapped the still forms against the backdrop of such chaos but it wasn't until later when I returned to the rink to file my photos that my editor pointed out that the two people were not hurt, but kissing." Now what we can take away from this interestingly sweet little misunderstanding is that even still picture lies. While this picture might not be the "Photo of the Year" (given the fact that we are only almost halfway into 2011), it's a definite shoo-in for "Kiss of the Year". Personally, I'm just glad it's not Photoshop.